Kahului has the odd distinction of being a Maui town that few visitors ever mention when asked to name a town on Maui. Yet almost every visitor to the island spends some part of their vacation in Kahului. Kahului is where the island's main airport is located, where visitors rent their car s , where they shop at one of the big box stores such as Cosco, Kmart, or Walmart, and through which they drive on the way to Hana, Haleakala, or Upcountry Maui. Kahului is all of that, but a whole lot more as well. Let's take a closer look at Kahului - how it came to be and what you'll find there. The history of Kahului, like much of modern Hawaii, is closely tied to the sugar industry. Prior to the middle of the 1800's, Central Maui was largely uninhabited. Henry Baldwin and Samuel Alexander purchased land near Makawao and started a sugar plantation, which was to expand greatly over the next century. 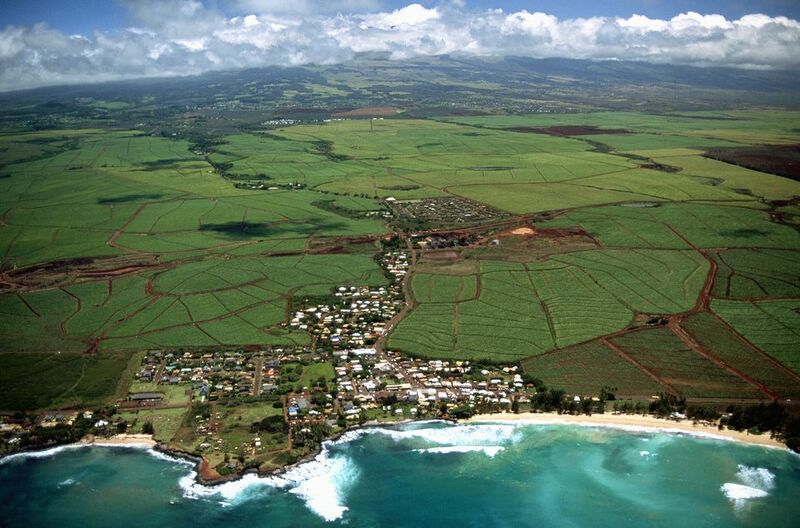 As the plantation expanded, so did the area of what is today, Kahului. In 1880's Kahului became the headquarters for Maui's first railroad, built to haul sugar from the fields to the refinery and harbor - all of which were owned by Alexander and Baldwin. A squatter town grew up in the area but was short lived when the bubonic plague epidemic of 1900 resulted in a decision to burn most of the town and kill the infected rats. The Kahului we know of today is a planned community developed in 1948 by the Alexander & Baldwin Sugar Company. Nicknamed "dream city" by the cane workers it was a much nicer place to live than the dreary barracks of the plantation camps. The town continued to grow with more homes, roads, stores and, by the 1940's, the major airport serving the island of Maui. Today, Kahului is Maui's major town. Let's see what you'll find in Kahului today. Kahului Airport is the primary airport on Maui and second busiest airport in Hawaii (over 6-million total passengers per year) and the newest in terms of terminal facilities. The airport has full air carrier facilities for domestic overseas and inter-island commercial service. Kahului Airport provides commuter/air taxi and general aviation operations, including helicopter operations. Vehicular access to the passenger terminal, commuter/air taxi, cargo, scenic tour operators, general aviation facilities, and airport support facilities is by a roadway network that connects to the Haleakala and/or Hana Highways. If you arrive on Maui by ship, the only place on the island where your ship can dock is at Kahului Harbor. The facilities are poor and a master plan has been developed to improve them for passengers and commercial use. At one point, the harbor welcomed three NCL ships each week and the Hawaii Superferry every day. There was much uproar within the local community regarding the impact of these vessels on the island and community since the harbor is also used for surfing, fishing, and the essential functions of several canoe clubs both to practice and to race. Currently, only one NCL ship makes regular stops at Kahului. As you drive along Dairy Road on the way to and from the airport or on Kaahumanu Road to or from Waikluu one thing you'll immediately notice is that Kahului is Maui's principal shopping district. Along Dairy Road (Hwy 380) you'll find all the big box stores - Costco, Kmart, The Home Depot, and Wal-Mart - as well as a number of smaller size national chains such as Borders, Eagle Hardware, Office Max, and Sports Authority at the Maui Marketplace. Along Kaahumanu Road you'll pass the island's largest shopping mall, the Queen Ka'ahumanu Center with over 100 shops and restaurants including Maui's only department stores - Sears and Macy's. You'll also pass the smaller Maui Mall best known for Longs Drug Store and home to a new Whole Foods Market. Located on the Wailuku side of Kahului, the Maui Arts & Cultural Center (MACC) defines themselves as "a gathering place where we celebrate community, creativity, and discovery." It is all of that and more. The MACC hosts over 1,800 events each year including major music and theater productions, hula, symphony, ballet, taiko drumming, drama, children’s art, slack key guitar, popular music, acrobatics, storytelling, and more. In addition, the MACC is a frequent gathering place for community meetings and school events. "The MACC Presents ..." series consists of 35-45 events each year featuring the best Hawaiian and local artists in diverse fields of entertainment. To see the top stars of Hawaiian music and dance, go to the MACC. The Aloha Friday Farmers Market is held every Friday from 12 noon to 6 p.m. on the campus lawn and inside the Paina Building of the Maui Community College across from the Maui Arts & Cultural Center on West Kaahumanu Avenue in Kahului. The market was started to bring local produce to local people and visitors. Many farmers can't compete with off-island growers because of the high cost of production and land on Maui. Here you'll find fresh Maui produce sold directly by many of Maui's best farmers. The produce here is fresher than you'll find anywhere else on Maui. Much of it has been harvested that very morning. On Saturday from 7 a.m. to 1 p.m. Kahului is home to the longtime Maui Swap Meet. The swap meet has moved from its former location on Puunene Avenue to a new home at the Maui Community College. It's still the best bargain on Maui with an admission of only 50 cents! You'll find many of the same items that you will in the boutique and craft stores in Kihei, Lahaina, and Wailea for a lot less money. You'll find t-shirts, necklaces, leis, and handmade crafts often sold directly by the artist. You'll find lots of fresh Hawaiian flowers and wonderful fresh fruits, homemade baked goods, and vegetables grown on Maui. You'll also find lots of Hawaiian fabric at great prices. Most visitors never get to Kahana Beach Park or even know where it is. It is located behind the Kahului Airport. The easiest way to get to it is to travel towards Wailuku on the Hana Highway. When you see the Maui Mall on your left, look for Hobron Avenue on the right. Turn right onto Hobron and then right onto Amala Place. The beach is down the road on your left. Kanaha Beach Park is a lifeguarded beach that is very popular with windsurfers and kiteboarders. There are bathroom and shower facilities as well as a barbecue and picnic area. This large bird sanctuary and wetlands are located on the opposite side of Amala Place from Kahana Beach Park. Parking is available and admission is free. The sanctuary is home to two endangered Hawaiian species, the 'alae (Hawaiian coot) and the ae'o (Hawaii stilt). You will also likely see the koloa maoli (Hawaiian duck). It was designated a National Natural Landmark in 1971. Maui Nui Botanical Gardens is located right in the center of Kahului. Focused strictly on Hawaiian plants, this garden makes no distinction between the conservation of plant species and the conservation of native culture. The garden is open from 8 a.m. to 4 p.m. on Monday through Saturday. It is closed on Sundays and major holidays. Admission is free.